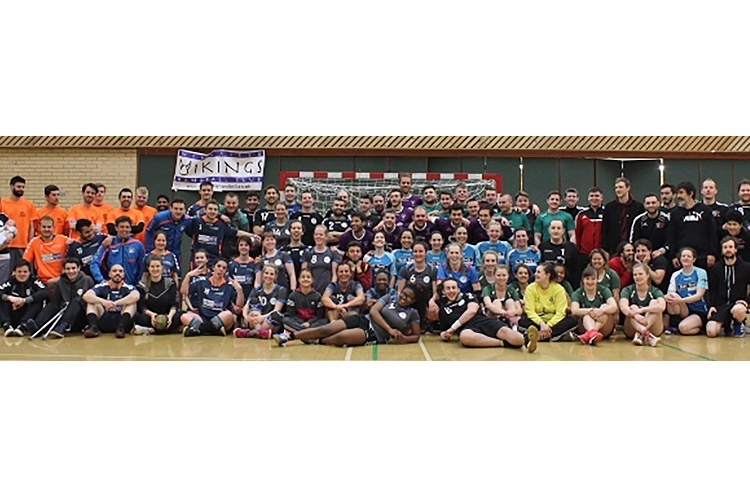 Glasgow and Edinburgh took the men’s and women’s honours respectively at the fifth annual Tyneside Handball Tournament. Glasgow beat East fiilbride’s EK82 16-11 in a repeat of the 2014 final, to regain their title and be crowned champions for a third time. Maciej Trzos socred six times for Glasgow, while Jack Lees notched the same amount for East Kilbride. Durham University claimed third place with a 12-7 win over Bedfordshire’s Cranfield University. Newcastle Vikings defeated York Hunters 12-5 in the fifth/sixth place play-off. In the women’s competition Edinburgh won for the first time since 2013, beating the University of Leeds 11-5 in the final. Emma Andersen led the way for Edingburgh with four strikes. Having surrendered their title, Newcastle Vikings’ ladies beat Cranfield University 7-5 to take third place. The men’s tournament top-scorer award went to Durham University half-player Lucas Palumbo with 21 goals. University of Leeds winger Magda Karwatka top-scored in the women’s competition with 11 goals.